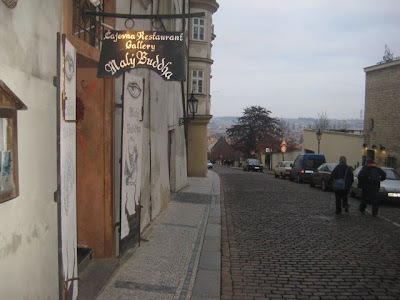 Malý buddha (Little Buddha) isn't perfect. Not even close. Don't laugh, but I'd still recommend it. I'll explain later. 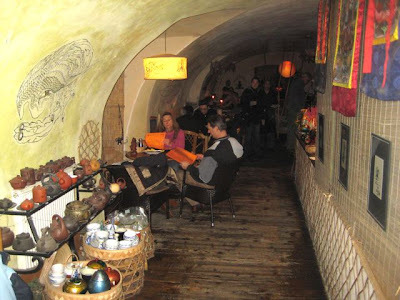 The restaurant is close to Prague Castle and Strahov Monastery. We booked ahead on a cold Saturday afternoon, just to be sure we wouldn't be turned away. The restaurant is long and narrow, and doesn't have many tables. 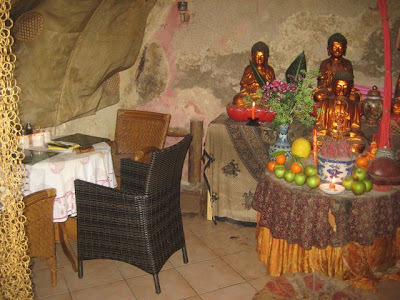 There were some Buddhas in the back, along with a few more seats. It was fairly dark and reading the menu by candle light was a bit of a challenge. 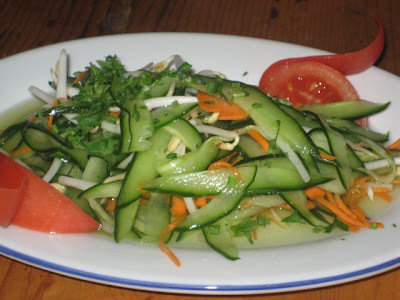 I started with a cucumber salad (60 CZK). It was sweet and sour, with shredded carrots and bean sprouts mixed in. I'm not a big bean sprout fan, but I liked it. V got the ginger salad (80 CZK). The menu says it is a good remedy for sore throats. It was also fairly sweet. I was nicely surprised that there were, indeed, slices of real, fresh, and sharp ginger mixed in with the more mundane iceberg lettuce. 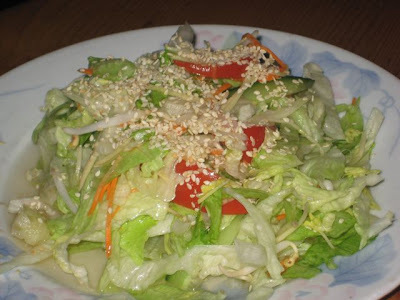 There were also sesame seeds, with a small amount of tomato, cucumber, carrot, and bean sprouts. For a main course, I ordered a dish called "The Nightmare." (210 CZK). 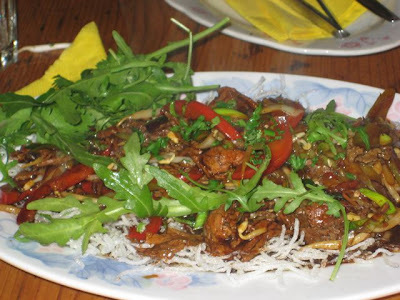 It is described as beef sirloin with onion and garlic with chili and lemon grass. It was too salty, dominated by soy sauce. There was a touch of sweetness. The beef was not really what I'd called sirloin, but it was reasonable quality and not too tough. There was certainly a good quantity, and it was very filling. What really saved the dish from mediocrity was the generous amount of fresh rucola and cilantro on top. They helped the flavor a lot. I also asked for some extra chili sauces and added more sweetness to cut the savory edge. 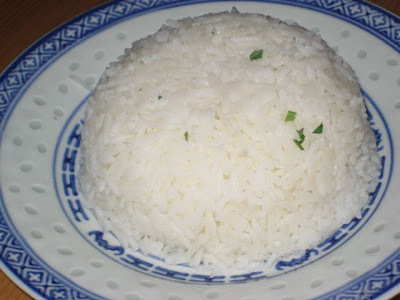 Mixing it with rice (18 CZK) also helped in that respect. 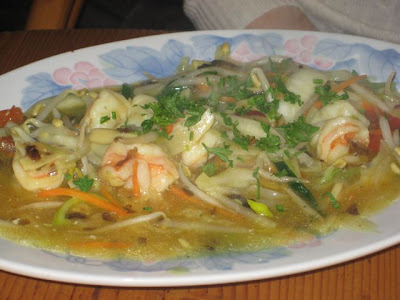 V got the prawns with Chinese mushrooms and bamboo shoots (220 CZK). The prawns were nicely cooked, but that was about all we liked about this dish. It tasted very Czech-Chinese, if that means anything to you. Just salty and boring. The mushrooms did not appear particularly Chinese to us. 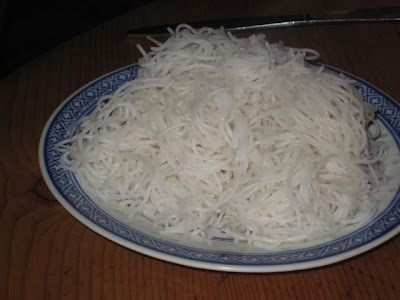 A side order of white noodles (18 CZK) didn't make it any better. 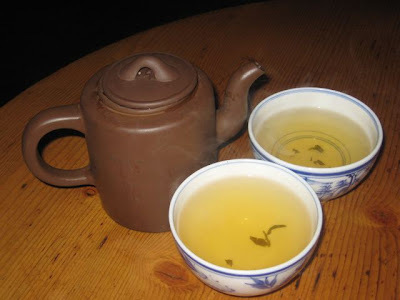 It being a cold day and this being a tea house, we decided to order a pot. We got the jasmine tea (45 CZK). It had a beautiful, perfume-like aroma. We enjoyed it. There were dozens of other teas on the menu to choose from. 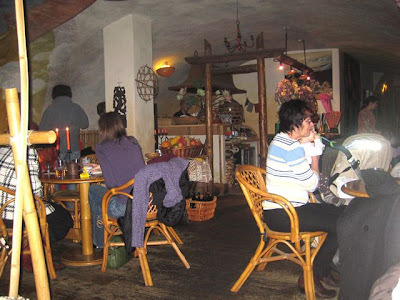 The bill, which included wine and beers, added up to 836 CZK. 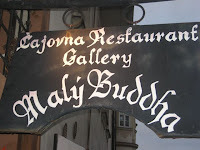 I would not recommend Malý buddha for outstanding food or service. It had neither. 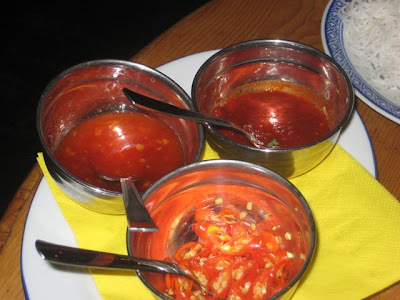 But I would recommend it because it was fairly priced for the area, had a cozy atmosphere, and the food was the most part, acceptable, if nothing special. With all due respect to Mr. Gautama, the lack of good value restaurant choices in this prime tourist zone is no laughing matter. You just have to realize that with so many perfectly bad establishments nearby, you could certainly do far worse. Food is great and so is the location, but the service is horrible!! !